I'm Not a Rugby Virgin Anymore, Oh and Happy Birthday Dad! 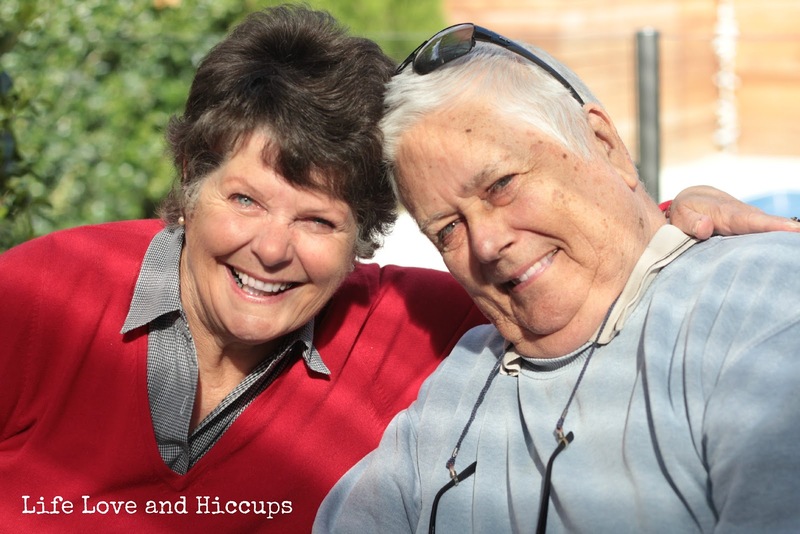 | Life Love and Hiccups: I'm Not a Rugby Virgin Anymore, Oh and Happy Birthday Dad! I'm Not a Rugby Virgin Anymore, Oh and Happy Birthday Dad! 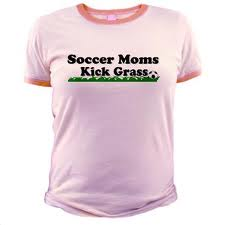 I'm a soccer mum through and through. After years on the sidelines cheering my kids on, I know the rules, I'm comfortable that what I am calling out to my kids on the field is relevant to the game and I have a voice and more to the point, I'm not afraid to use it. This year however, one of my boys after 6 years of being totally dedicated to his dream of playing for the Socceroos, decided that he really wants to be a Wallaby instead and defected to the world of Rugby Union. Now this is a whole different ball game we are playing here - pun TOTALLY intended! We turned up for registration day and the coach took one look at my solid first born and rubbed his hands in glee and said "Great, we need more front rowers!" I very nearly shat my pants right there and then. My boy, my BABY on the front line with all that grunting and studs and head smashing action? What on earth had I agreed to? I felt slightly better about the prospect after we headed straight to the local sports store and spent a small fortune on head gear, mouth guards, shoulder pads and an industrial sized drum of Dettol. But despite all that saftey gear, I still can't help but fret about my precious boy being chased down by a bunch of dudes ready to eagerly smash him to the ground. It didn't help my fragile nerves when at the first training session of the season one of his teams mates was carted off in an ambulance with an arm that was snapped in two places. I think it was at that the point our gorgeous team manager Jody enlightened me to the fact that the canteen sold wine by the glass. Coping Cordial, liquid courage whatever you want to call it, I was very grateful to Jody and thought to myself, that's one smart team manager my boy has there. I know nothing about Rugby and it seems that no amount of explaining seems to make an iota of a difference. It goes in one ear and out the other and I'm hands up admitting defeat on the subject. I figure I'll just cheer when all the other parents on our team are cheering or when my boy has the ball in his hands or brings down another kid on the opposite team who has the ball in his hands. In my case however it seems that ignorance equals silence and my son has been very grateful that my days of screaming out from the sidelines are behind us.... until today. Today was special. Today our team won their second game of the season with a score of 47 to 7 and today my boy scored his first try. Yes today was the day I lost my Rugby Virginity and graduated from the silent spectator role and let the world know (or at least everyone at this particular field) that I'm not really the shy reserved and quiet new Rugby mum after all. 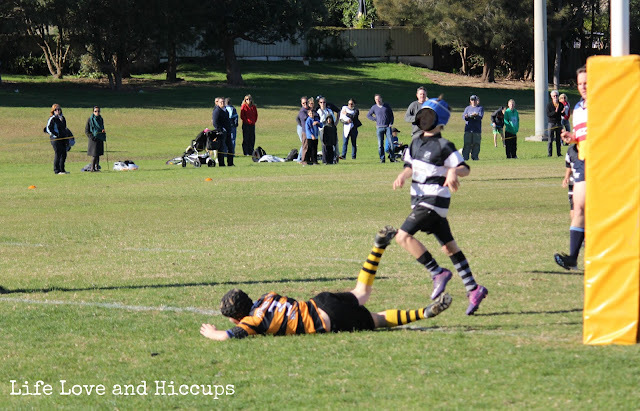 I screamed like a banshee as my son dodged, trampled and barged and galloped the length of the field before performing a totally unnecessary but super impressive superman style dive over the try line. I was fist punching the air, jumping up and down and hugging anyone in grabbing distance. I desperately wanted to run out onto the field and smother my boy in kisses, but a little voice inside my head called a conscience insisted that it would just be too cruel. Instead I waited until after the game and then I went into full gush mode. Luckily my hubby was snapping away with the camera and managed to capture his try in all it's glory, including the spectacular Superman dive. I still know nothing about how the game is played and I am sure I will still stress about every little thump or tackle I witness, but by hell I found my voice and my enthusiasm for this game today and I am proud to say that I am now a Soccer mum AND a Rugby mum to boot! On another happy note, this weekend my beautiful Dad celebrated his 71st Birthday. I will never ever have difficulty figuring how old my dad is turning as he turned 60 just 7 weeks after my first son was born. 60 is a big milestone birthday and my Dad had to make it one to remember for all of us by getting some bizarre illness that left him in a coma and on life support for over a week. Yeah we don't do things by halves in this family. We were laughing today over lunch as we remembered some of the funnier moments of what was possibly one of the most stressful times of my life. You see we are a bit of a strange family with a very off centre sense of humour and whilst we waited to see if our precious Dad would wake from his coma we hatched ideas about what we were going to tell him had happened whilst he was out of it. Oh nothing too far fetched, we were just going to age him about 20 years, tell him his 6 month old granddaughter was married and that Steve Irwin was now Prime Minister of Australia. Cruel aren't we, but hey they were dark hours we were facing and our twisted plans made us laugh at a time that laughter would normally have been the last thing you would expect from a quiet ICU room. Thankfully my Dad pulled through and is still with us today. He is adored by all his grandchildren and his kids and my mum. Not so much by the local post office, newsagency, Medicare Office and his local Aldi, but hey we cant be friends with everyone right. The thing about my Dad is he calls a spade a spade - he is also an incredibly inspiring role model, has a wicked sense of humour, is admirably strong of opinion, fiercely loyal and supportive and has the most generous of hearts, but he calls a spade a spade. He is certainly not afraid of speaking his mind which I so admire about him and a spade will never go to sleep wondering if it is or isn't, because if you ask my Dad, it's an effing spade alright! Dad, I have no idea why, but I am not really good with always telling you how I feel in words. I give you the biggest of hugs and I hope you can feel how much I love you in those hugs, but I also hope you know that I adore you and everything about you. You are the most wonderful pop in the world and I give you a Platinum A plus in the dad stakes and I am just so grateful that my own children have had the chance to enjoy what a wonderful man and father you are. Happy Birthday Dad and a HUGE cheers to many more and I promise you the first dance at your grandaughter Meg's wedding. I have another exciting giveaway coming up this week, so stay tuned folks! In the meantime, tell me - do your kids play sport? If so are you a vocal spectator or do you manage to show self restraint?